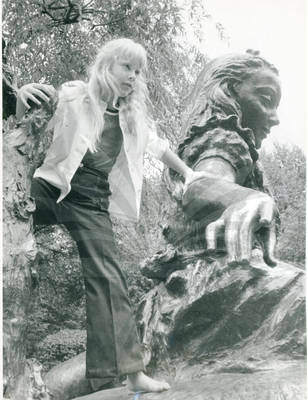 "Amy Carter in Central Park"
Barefooted Amy Carter, 8, daughter of Jimmy Carter, frolics on a giant statue of Alice in Wonderland while visiting New York's Central Park July 13. The Carter family is in town for the Democratic National Convention. All indications were that Jimmy Carter would be selected as the Democratic presidential candidate. Black and White Photograph, 8" x 10"